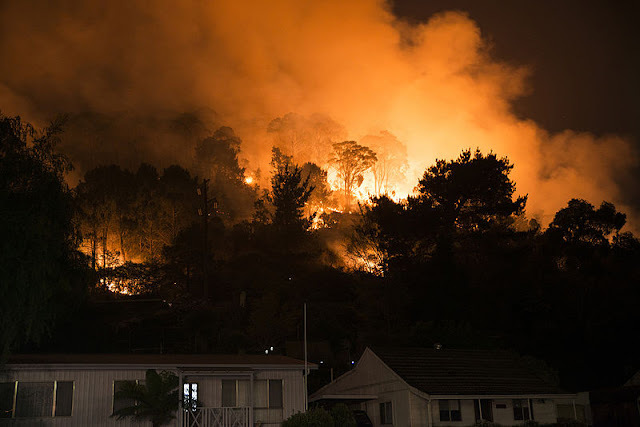 A massive wildfire in Australia which has hit parts of Sydney and is out of control has been started deliberately according to authorities in which is becoming a very worrying trend in the West recently, with one government in Europe claiming wildfires is the latest terrorist weapon. With the wild-fire travelling so fast residents have been advised in the area it is too late to leave, advising them to seek shelter as the fire front approaches and to protect themselves from the heat of the blaze. The large bushfire is threatening homes in Sydney and is likely to have been deliberately started in what is a new trend in recent times, the wild-fire has become the new terrorist weapon. Last year was a record-breaking twelve months for wildfires with many of the massive wildfires last year in California, Australia, Spain, Portugal and Italy all being blamed on arson which led the Italian government to claim wildfires where being used as a terrorist weapon. According to the BBC, the blaze, which began on Saturday, has burnt through 2,500 hectares of land in the city's southern suburbs. The New South Wales Rural Fire Service (RFS) described the blaze as "highly suspicious". The bushfire forced some locals to evacuate their homes on the weekend, while others were told it was too dangerous to leave. Recent weather in south-eastern Australia has been unseasonably hot, with strong winds fanning bushfires. Prime Minister Malcolm Turnbull has praised the emergency response. "It is unseasonably hot and that's a matter of obviously great concern, but we have to deal with the worst that Mother Nature can throw at us and the worse Australians are presented with by nature, the better it brings out the Australian spirit," he said.